Archbishop Chimeledya was born in Zoisa, Tanganyika on 28 Aug 1957. He was educated in Ziosa and after performing his military service worked for World Vision Tanzania. He was educated at The Institute of Development and Management at Mzumbe University earning a diploma in health administration in 1992 and trained for the ministry at St. Paul’s United Theological College in Limeru, Kenya from 1993 to 1996, and earned a Master of Arts degree from the Virginia Theological Seminary in 2003. Ordained deacon in 1996 and priest in 1997 for the diocese of Mpwapwa, he served as a parish priest at St. Paul’s in Mpwapwa, St. Michael’s in Kongwa, and St. Peter’s in Kongwa, Mlanga. He was chaplain to Bishop Simon Chiwanga, Diocesan Youth Secretary, Principal of Chamhawi Bible School, Area Dean for Kongwa Deanery, principal of St Philip’s Theological College in Kongwa from 2003 to 2005. 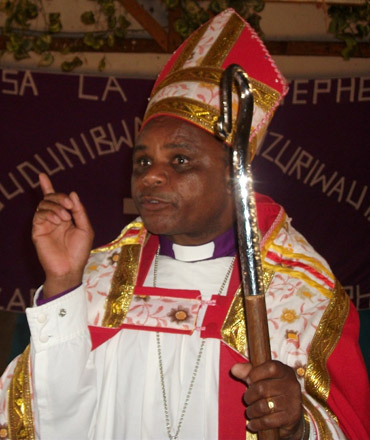 He was elected Bishop-coadjutor of the Diocese of Mpwapwa 12 July 2005 and was installed as the second bishop of the diocese on 30 Sept 2007 following the retirement of Bishop Chiwanga. On 21 February 2013 he was elected Archbishop of Tanzania in a hotly contested election, unseating the incumbent Archbishop Valentino Mokiwa of Dar es Salaam. He is married to Mwezwa with 4 children Happinness, John, Gamalieli and Margreth.